Gabriel Charles Dante Rossetti, later Dante Gabriel Rossetti (May 12, 1828 – April 10, 1882) was an English poet and painter who is considered one of the founding members of the Pre-Raphaelite movement in the arts, as well as one of the most important authors of the Victorian era in English literature. Rossetti, like his fellow Pre-Raphaelites, believed that English literature had drifted astray from the fundamental principles of artistic integrity that Rossetti believed could be found in the painting and poetry of the medieval world. Rossetti's Pre-Raphaelite movement bore a number of distinct similarities to the English Romanticism, and Rossetti was in fact deeply influenced by Romantic poets John Keats and William Blake. As a poet, however, Rossetti was distinct from the Romantics due to his particular fascination with medieval literature. In his poetry, Rossetti attempted to capture the deeply symbolic and at times arcane style of medieval poets, which results in some of the most interesting and, at times, baffling poetry in the English language. Like many other poets of the Victorian era, Rossetti was prone to extremely florid languages, and his poetry may seem somewhat baroque to a contemporary reader. Nonetheless, Rossetti had a considerable influence on the development of late nineteenth-century poetry. As one of the most successful of all Victorian poets, Rossetti had a direct influence on a number of poets of the succeeding generation, among them the early Ezra Pound. Moreover, Rossetti was one of the most talented artists, both in the literary and visual arts, during a period of significant upheaval in European artistic tastes. Rossetti grappled with the fundamental struggle of modern life, the disappearance of spiritual values in the creation of mass society. His work attempted to reintroduce that missing spirituality. Rossetti was born the son of an emigrated Italian scholar named Gabriele Rossetti. He was born in London, and was originally named Gabriel Charles Dante Rossetti. His family and friends called him "Gabriel," but in publications he put the name Dante first because of its literary associations. The Rossetti family was a remarkable one, and Rossetti's sister Christina would also become a poet of considerable renown, while his brother William Michael would become a major literary critic of the period. At a very early age, Rossetti showed a strong interest in literature. Like all his siblings, he aspired in his youth to be a poet. Rossetti, however, felt conflicted; he also wished to be a painter, having shown a great interest in medieval Italian art. Unable to decide, he studied draughtsmanship under Ford Madox Brown. The two artists would remain on close terms throughout the rest of their lives, and the apprenticeship would set the young Rossetti on the path of becoming a successful painter. Following the exhibition of William Holman Hunt's painting The Eve of St. Agnes, Rossetti sought out Hunt's friendship. The painting illustrated a poem by the then still little-known John Keats. Rossetti's own poem "The Blessed Damozel" was an imitation of Keats, and so he believed that Hunt might share his artistic and literary ideals. Together, Hunt and Rossetti developed the philosophy of the Pre-Raphaelite Brotherhood. Despite his aversion to realistic art, Rossetti's first major paintings display some of the realist qualities of the early Pre-Raphaelite movement. Some of the Pre-Raphaelites—Hunt in particular—felt that art of the medieval world had paid extreme attention on the nature of its subjects, and that in more recent art, beginning with the works of the Italian painter Raphael, visual art had moved further and further into needless abstraction and decorousness. Although Rossetti would later reject many of these ideas, he would absorb some of them, as can be seen in his paintings Girlhood of Mary, Virgin and Ecce Ancilla Domini, which both portray Mary as an unattractive, repressed, and ordinary teenage girl. His incomplete picture Found was his only major modern-life subject. It was to have depicted a prostitute lifted up from the street by a country-drover who recognizes his old sweetheart. However, Rossetti increasingly preferred symbolic and mythological images to realistic ones, both in his own paintings and increasingly in his poetry, and soon he would abandon realistic art entirely. Although he won support from John Ruskin, Rossetti's paintings received harsh criticism from the general public. Distraught, Rossetti abandoned exhibiting his paintings; he turned to watercolors, which were small enough to be sold privately. During this time he turned increasingly to his writing in order to capture the images which he could not portray in his paintings. Subjects taken from Dante Alighieri's La Vita Nuova (which Rossetti had translated into English) and Sir Thomas Malory's Morte d'Arthur inspired his art in the 1850s. His visions of Arthurian romance and medieval design also inspired his new friends of this time, William Morris and Edward Burne-Jones. With Morris and Burne-Jones, Rossetti would found a second Pre-Raphaelite Brotherhood. Rossetti had grown estranged from William Holman Hunt and some of the other earlier Pre-Raphaelites because they had not, at least in Rossetti's estimation, paid enough respect to the traditions of medieval art. The "new" Pre-Raphaelites, led by Rossetti, Morris, and Burne-Jones, would pioneer the intentionally archaic style of poetry that would cement Rossetti's reputation as a major literary figure. In part, these developments in Rossetti's literary style were precipitated by events in his private life, in particular the death of his wife Elizabeth Siddal by suicide in 1862. Rossetti became increasingly depressed, and buried the bulk of his unpublished poems in her grave at Highgate Cemetery. He began to idealize her as the image of Dante's Beatrice in a number of paintings, such as "Beata Beatrix," as well as in a number of poems dedicated to her. During this time, Rossetti became increasingly eccentric. He developed an obsession for exotic animals, in particular, wombats. He would frequently ask friends to meet him at the "Wombat's Lair" at the London Zoo in Regent's Park, and would spend hours there himself observing the creatures. After several years, Rossetti was prevailed upon by friends to exhume his poems from his wife's grave. Finally he gave in, collating and publishing them in 1871. They created a controversy when they were attacked as the epitome of the "fleshly school of poetry." The frank eroticism and sensuality of some the poems shocked the literary community of Rossetti's time. In particular, the sonnet sequence The House of Life was both ridiculed and praised for its frank sensuality. The House of Life, a complex series of poems tracing the physical and spiritual development of an intimate relationship, was written so that, in Rosetti's words, each sonnet in the sequence could capture a "moment's monument." The House of Life was a series of interacting monuments to fleeting moments—an elaborate whole made from a mosaic of intensely described fragments, which would prove to be Rossetti's most substantial literary achievement. Toward the end of his life, Rossetti sank into a morbid state, darkened by his drug addiction and increasing mental instability, and worsened by his reaction to savage critical attacks on the manuscript poems he had buried with his wife. He spent his last years as a withdrawn recluse. He died and is buried at Birchington-on-Sea, Kent, England. 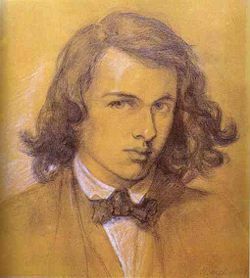 History of "Dante Gabriel Rossetti"
This page was last modified on 14 November 2017, at 19:20.